By GUY WALTERS FOR THE DAILY MAIL18 January 2016 “……the B-52 had overshot and the boom had missed the fuel nozzle in the top of the plane. Instead, the boom had smashed into the bomber with such force that its left wing was ripped off. Fire quickly spread up the fuel-filled boom and ignited all 30,000 gallons of the tanker’s kerosene, causing it to plummet to the ground. Meanwhile, the bomber started to break up, and the crew did their best to get out of the plane using parachutes. As for the hydrogen bombs, there was nothing that could be done. In less than two minutes, they would be crashing into the Earth at an enormous speed — potentially destroying much of the regions of Andalucia and Murcia. What in the name of God are doing, Pepé? Get away from there! This could be dangerous. Hundreds of thousands of people could be about to die, and the nuclear fallout would have the capacity to kill millions more all over Europe — not just from radiation poisoning but from cancers for decades to come…….. This is basically an engineering project like no other. Its timescale will dwarf the oldest cathedrals. this time they have legislation in place to make sure the county council can’t stop it. It’s an abuse of democracy. Hardest sell: Nuclear waste needs good home By Greig Watson BBC News 18 January 2016 “…….Steadily produced since the end of World War Two, the question of what to do with the nuclear waste from civil, military, medical and scientific uses has been causing equal measures of fear and frustration for decades. With a new generation of nuclear power stations on the way, a fresh search is under way for a community ready to take on the challenge. Campaigner Eddie Martin says: “It’s very worrying, scary even. They have been looking for somewhere to put this material for decades and it keeps coming back to Cumbria.”……. Nuclear power stations have been built in 31 countries but only a handful ,including Finland, Sweden, France and the US have started building permanent storage facilities. All of these are purpose-built caves hundreds of metres below ground, known as a Geological Disposal Facility (GDF). Once the waste is treated and sealed inside containers, it is stacked in the caverns. GDFs are expected to remain secure for thousands of years. Dr Robert says GDFs or deep boreholes are two possible options for the disposal of radioactive waste but there are still challenges to overcome, particularly in predicting their behaviour over hundreds or thousands of years. How long are people going to tolerate this nuclear tragedy? The Shockingly High Number of Casualties of America’s Nuclear Weapons Program http://historynewsnetwork.org/article/161607?__scoop_post=74a15000-b971-11e5-b8b0-00221934899c&__scoop_topic=2427585#__scoop_post=74a15000-b971-11e5-b8b0-00221934899c&__scoop_topic=2427585 by Lawrence S. Wittner– When Americans think about nuclear weapons, they comfort themselves with the thought that these weapons’ vast destruction of human life has not taken place since 1945—at least not yet. But, in reality, it has taken place, with shocking levels of U.S. casualties. This point is borne out by a recently-published study by a team of investigative journalists at McClatchy News. Drawing upon millions of government records and large numbers of interviews, they concluded that employment in the nation’s nuclear weapons plants since 1945 led to 107,394 American workers contracting cancer and other serious diseases. Of these people, some 53,000 judged by government officials to have experienced excessive radiation on the job received $12 billion in compensation under the federal government’s Energy Employees Occupational Illness Compensation Program. And 33,480 of these workers have died. How could this happen? Let’s examine the case of Byron Vaigneur. In October 1975, he saw a brownish sludge containing plutonium break through the wall of his office and start pooling near his desk at the Savannah River, South Carolina nuclear weapons plant. Subsequently, he contracted breast cancer, as well as chronic beryllium disease, a debilitating respiratory condition. Vaigneur, who had a mastectomy to cut out the cancer, is today on oxygen, often unable to walk more than a hundred feet. Declaring he’s ready to die, he has promised to donate his body to science in the hope that it will help save the lives of other people exposed to deadly radiation. Actually, workers in nuclear weapons plants constitute only a fraction of Americans whose lives have been ravaged by preparations for nuclear war. A 2002 report by the U.S. Department of Health and Human Services maintained that, between 1951 and 1963 alone, the atmospheric testing of nuclear weapons—more than half of it done by the United States—killed 11,000 Americans through cancer. As this estimate does not include internal radiation exposure caused by inhaling or swallowing radioactive particles, the Institute for Energy and Environmental Research has maintained that the actual number of fatal cancers caused by nuclear testing could be 17,000. Of course, a larger number of people contracted cancer from nuclear testing than actually died of it. The government study estimated that those who contracted cancer numbered at least 80,000 Americans. During subsequent decades, leukemia and other cancer rates soared in the counties adjoining the Nevada test site, as they did among the 250,000 U.S. soldiers exposed to U.S. nuclear weapons tests. From the standpoint of U.S. military commanders, it was vital to place American soldiers close to U.S. nuclear explosions to get them ready to fight in a nuclear war. Subsequently, as many of these soldiers developed cancer, had children with birth defects, or died, they and their family members organized atomic veterans’ groups to demand that the federal government provide medical care and financial compensation for their suffering. Today, atomic veterans receive both from the federal government. Uranium miners comprise yet another group of Americans who have suffered and died from the U.S. nuclear weapons program. To obtain the uranium ore necessary to build nuclear weapons, the U.S. government operated thousands of uranium mines, often on the lands of Native Americans, many of whom worked as miners and died premature deaths. The U.S. Public Health Service and the National Institute for Public Safety and Health conducted studies of uranium miners that discovered alarmingly high rates of deaths from lung cancer, other lung diseases, tuberculosis, emphysema, blood disease, and injuries. In addition, when the uranium mines were played out or abandoned for other reasons, they were often left as open pits, thereby polluting the air, land, and water of the surrounding communities with radiation and heavy metals. This American nuclear catastrophe is not only a matter of the past, but seems likely to continue well into the future. The U.S. government is now beginning a $1 trillion program to “modernize” its nuclear weapons complex. This involves building new nuclear weapons factories and labs, as well as churning out new nuclear weapons and warheads for firing from the air, land, and sea. Of course, if these weapons and their overseas counterparts are used, they will destroy the world. But, as we have seen, even when they are not used in war, they exact a dreadful toll—in the United States and, it should be noted, in other nations around the world. How long are people going to tolerate this nuclear tragedy? Modernizing’ the Opportunities for Nuclear War Huffington Post, Lawrence Wittner Professor of History emeritus, SUNY Albany, 18 Jan 16, A fight now underway over newly-designed U.S. nuclear weapons highlights how far the Obama administration has strayed from its commitment to build a nuclear-free world. The Federation of Atomic Scientists pointed out that the high accuracy of the weapon and its lower settings for destructiveness might tempt military commanders to call for its use in a future conflict……. Another weapon undergoing U.S. government “modernization” is the cruise missile. Designed for launching by U.S. bombers, the weapon–charged William Perry, a former secretary of defense–raised the possibilities of a “limited nuclear war.” Furthermore, because cruise missiles can be produced in nuclear and non-nuclear versions, an enemy under attack, uncertain which was being used, might choose to retaliate with nuclear weapons. Overall, the Obama administration’s nuclear “modernization” program–including not only redesigned nuclear weapons, but new nuclear bombers, submarines, land-based missiles, weapons labs, and production plants–is estimated to cost as much as $1 trillion over the next thirty years. Andrew C. Weber, a former assistant secretary of defense and former director of the interagency body that oversees America’s nuclear arsenal, has criticized it as “unaffordable and unneeded.” After all, the U.S. government already has an estimated 7,200 nuclear weapons. The nuclear weapons modernization program is particularly startling when set against President Obama’s April 2009 pledge to build a nuclear weapons-free world. Although this public commitment played a large part in his receipt of the Nobel Peace Prize that year, in succeeding years the administration’s action on this front declined precipitously. It did manage to secure a strategic arms reduction treaty (New START) with Russia in 2010 and issue a pledge that same year that the U.S. government would “not develop new nuclear warheads.” But, despite promises to bring the 1996 Comprehensive Test Ban Treaty to the Senate for ratification and to secure further nuclear arms agreements with Russia, nuclear disarmament efforts ground to a halt. Instead, plans for “nuclear modernization” began. The president’s 2016 State of the Union address contained not a word about nuclear disarmament, much less a nuclear weapons-free world. Russia’s lack of interest in further nuclear disarmament agreements with the United States provided another key obstacle. With 93 percent of the world’s nuclear weapons in the arsenals of these two nations, a significant reduction in nuclear weapons hinged on Russia’s support for it. But, angered by the sharp decline of its power in world affairs, including NATO’s advance to its borders, the Russian governmentengaged in its own nuclear buildup and spurned U.S. disarmament proposals. To register as Interested and Affected Parties write to Ferret Mining at info@ferretmining.co.zaor call 012 753 1284/5. Uranium Mining Threatens the Karoo, Karoo Space, 18 Jan 16 By Dr Stefan Cramer Images sourced by Dr Stefan Cramer Just as the threat of fracking seemed to recede in the Karoo, the danger of uranium mining has arisen – and it is even more frightening and more likely than shale gas extraction. While the nation is still debating the pros and cons of fracking, the Environmental Impact Assessment (EIA) as the precursor to mining licences is nearing finalisation. During 2016 the Department of Mineral Resources will make a decision on the industry’s application………. extensive studies on the risks of uranium mining over many decades are available today. Defence & civil nuclear cooperation will dominate Francois Hollande’s visit Economic Times, By Dipanjan Roy Chaudhury, ET Bureau | 18 Jan, 2016, NEW DELHI: Defence and civil nuclear cooperation will not be the only things that will dominate the visit of Francois Hollande — the fifth French leader to be chief guest at India’s Republic Day celebrations — with India and Paris working to expand partnership in areas of smart cities, solar energy, counter-terrorism, rail infrastructure and space. While Hollande travels to Chandigarh (designed by Swiss-French architect Le Corbusier) as one of the 3 cities chosen by France to make them smart, the French leader would devote time towards providing support to India’s clean energy projects in the backdrop of Paris climate energy meet by being present at the foundation stone-laying ceremony for the International Solar Alliance Secretariat on January 25 in Gurgaon along with Prime Minister Narendra Modi, official sources indicated. Modi had launched the solar initiative at the Paris meet last November. The Modi government is investing an initial $30m in setting up the 120-country-solar alliance’s headquarters in India. The eventual goal is to raise $400m from membership fees, and international agencies. Companies involved in the project include Areva, Engie, Enel, HSBC France and Tata Steel. Areva is also setting up a nuclear power plant in Jaitapur, after France became the first country to conclude a civil nuclear deal with India following a clean waiver by Nuclear Suppliers Group in September 2008. What interested Aera reporter Atsushi Yamada about the article was Aikawa’s assertion that Toshiba Corp. was on hand for the negotiations. In 2006, Toshiba had bought a majority share in the American company Westinghouse, a manufacturer, like Toshiba, that started out in the home electronics field and eventually expanded into nuclear power plant construction. Japan said it would buy uranium mined in the central Asian country and in return Mongolia would tap Japan’s nuclear energy expertise in building power plants and, more significantly, nuclear fuel reprocessing facilities that would incorporate the acceptance of high-level nuclear waste from Japan and other countries. Aikawa told Yamada that while ostensibly the negotiations were between the three governments, the plans for the deal were drawn up by the U.S. and Toshiba with the aim of selling nuclear power plants to emerging economies under a scheme called Comprehensive Fuel Service. According to this scheme, vendors assure potential customers that they will handle any future nuclear waste produced by power plants the customers buy, which is why Mongolia’s acceptance of such waste is so important. Due to local resistance, neither the U.S. nor Japan has anywhere to dump spent fuel, even their own. Belgium’s neighbors concerned about nuclear safety, DW 18 Jan 16 Germany, the Netherlands and Luxembourg are all concerned about the re-starting of Belgian nuclear reactors. The government there promises better communication, but seems to feel little urgency to act. The Tihange 2 reactor had been shut down since March, 2014, following the discovery of tiny cracks in the reactor’s pressure vessel. But in November 2015, the Belgian nuclear authority saw “no obstacle” to restarting the reactor, which became operational again at the end of December 2015. A recent study commissioned by the Green party group in the European parliament, on the other hand, said the steel used in the pressure vessels was of such poor quality that – had this been known at the time of licensing- the reactor would never have been allowed to start operations. “How is it then possible to license the continuation of the power plants now that we are aware of all these problems,” wondered the Greens EU parliament co-president Rebecca Harms………. For their part, citizens in neighboring Netherlands are also worried about another nuclear site called Doel. Same as at the Tihange 2 reactor, tiny cracks have also been found at the Doel 3 reactor’s pressure vessel, causing it to be taken off the grid until its restart shortly before the end of the year. Only a short while later, the plant was closed again for a few days, after a water leak. The Doel site is also home to Belgium’s oldest reactor, Doel 1, which had been shut down in February 2015, following its 40th anniversary. But the government then decided to extend the lives of Doel 1 and Doel 2 by another 10 years. Widespread concern has prompted the Dutch minister for infrastructure, Melanie Schultz, to schedule a visit to Doel this Wednesday, together with Belgian Interior Minister Jambon, accompanied by inspectors from the Dutch nuclear authority………. In Belgium itself, the scientific council of the nuclear authority – known by the initials of its Flemish name, ‘FANC’ – last Friday issued a report proposing to revise existing nuclear emergency plans. One recommendation is to distribute iodine pills to the entire Belgian population. Current plans limit the distribution of such pills to people living within a 20-kilometer-radius of nuclear sites. on the whole, the Belgian government seems rather unfazed by the security concerns raised by its neighbors. According to Jan Vande Putte of Greenpeace Belgium, that has to do with the fact that Belgium’s main utilities provider, Electrabel, still has a strong influence over politicians, especially in the country’s French speaking region of Wallonia – an influence dating back to the times when the state-owned utilities provider was the only player in the country’s energy market. Ocean water has absorbed more than 90% of the excess heat and nearly 30% of the carbon dioxide generated by human consumption of fossil fuels,Guardian, Oliver Milman, 19 Jan 16, The world’s oceans are warming at a quickening rate, with the past 20 years accounting for half of the increase in ocean heat content that has occurred since pre-industrial times, a new study has found. US scientists discovered that much of the extra heat in the ocean is buried deep underwater, with 35% of the additional warmth found at depths below 700 meters. This means far more heat is present in the far reaches of the ocean than 20 years ago, when it contained just 20% of the extra heat produced from the release of greenhouse gases since the industrial revolution. The paper, published in Nature Climate Change, sheds further light on the vast quantities of heat being absorbed by the world’s oceans. Ocean water, which has a much higher heat capacity than air, has absorbed more than 90% of the excess heat and nearly 30% of the carbon dioxide generated by human consumption of fossil fuels. The vast Southern Ocean sucked up 1.2bn tonnes of carbon in 2011 alone – which is roughly equivalent to the European Union’s annual carbon output……. As the oceans warm, storm intensity increases and aquatic species are forced from their traditional ranges. Absorption of carbon dioxide has also made the oceans 30% more acidic, which is when the pH of the water drops, making it harder for creatures such as coral, oysters and mussels to form the shells and structures that sustain them. Uranium Mining Threatens the Karoo, Karoo Space, 18 Jan 16 By Dr Stefan Cramer Images sourced by Dr Stefan Cramer “……..It is particularly interesting to see who the South African partners are in this joint venture. The Black Economic Empowerment partner in this case is Lukisa, which holds a total of 26% of Tasman RSA Mines, primarily in the form of exploration rights and nuclear licenses from the National Nuclear Regulator . UK ambitions to build small modular nuclear plants may be realised as soon as 2025, according to Fluor Corp’s NuScale unit, which is seeking to be a pioneer in the market. NuScale plans to submit its 50-megawatt reactor design for approval by US nuclear authorities towards the end of 2016. That would leave it well placed to seek the UK equivalent, called Generic Design Assessment, in 2017, Tom Mundy, executive vice-president for program development at the US company, said in an interview in London. Britain is trying to secure new baseload power as it closes down all its coal-fired plants by 2025. Conventional nuclear power is proving expensive and time-consuming, while most companies don’t think it’s profitable to build new gas-fired stations. 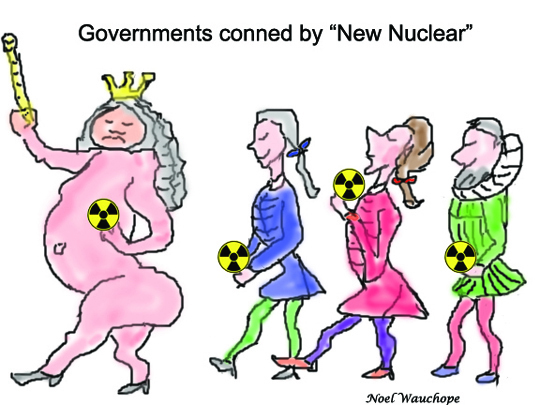 The Treasury in November said it will plow £250 million ($515 million) into research and development over the next five years aimed at building one of the world’s first small modular nuclear reactors in the 2020s……….. The global market for small modular reactors may total as much as £400 billion by 2035, according to a report in late 2014 by the National Nuclear Laboratory, which advises the UK government. It identified reactor designs that may meet UK requirements coming from NuScale, Toshiba.’s Westinghouse unit, China National Nuclear and the mPower venture by Babcock & Wilcox Enterprises. and Bechtel Group. When Chancellor of the Exchequer George Osborne announced the R&D funding for modular reactors, it was stated that a competition for funding will be held “early next year”. The Department of Energy and Climate Change said no fixed timetable has been set. Mr Mundy said he doesn’t doubt the government’s intentions. Russian scientists have come up with plans to protect the planet from asteroids heading towards Earth by launching nuclear missiles. Although the use of nuclear weapons in outer space is prohibited under a 1967 treaty, Russian scientists say that the ban would be lifted if the planet was in genuine danger. “If the asteroid threat becomes a matter of massive destruction or even the very existence of life on the planet, that ban would naturally be lifted,” they said. The plan would not be to destroy the asteroid but to deflect it off course to a safe distance from Earth. NEOShield, which received most of its funding from the EU, brought together researchers from Germany, France, Britain, Spain, Russia and the US. A three-year follow-up programme, NEOShield-2, began last March. Other proposals developed as part of the project include a “kinetic impactor”, deflecting asteroids by crashing small unmanned spacecraft into them. Uranium Mining Threatens the Karoo, Karoo Space, 18 Jan 16 By Dr Stefan Cramer Images sourced by Dr Stefan Cramer “…..According to its documents, Tasman RSA Mines today controls exclusive prospecting rights over more than 750 000 hectares in a circle of nearly 200 kilometres around Beaufort West. So far the company has not indicated whether they would use ‘in-situ-leaching’, a particularly dangerous but low-cost method. Here, large quantities of leaching agent are injected underground. The uranium is dissolved and recovered in well fields. The devastating impacts of uranium mining on people, especially the mine workers, and the environment have been well research and documented. Several studies of large number of cases and with exposure over many years (Wismut AG in the former East Germany, theColorado-Plateau in the USA, and Saskatchewan in Canada, have established a particular direct relationship between occupational exposure to uranium and its decay products and lung diseases.